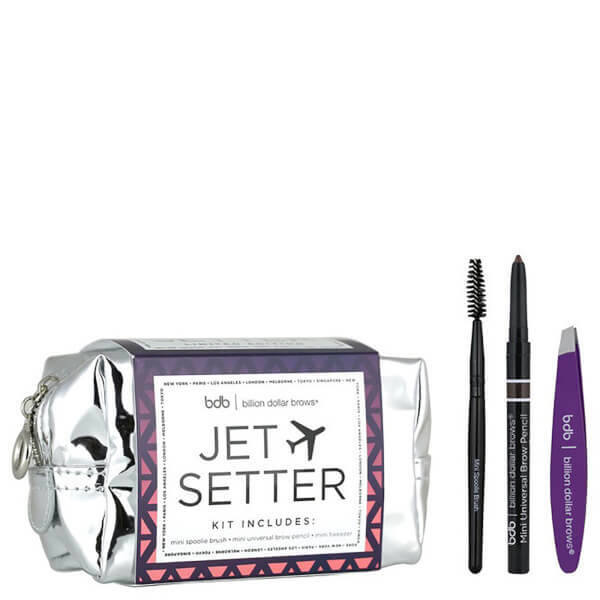 Achieve symmetrical, perfectly shaped brows with the Jet Setter Kit from Billion Dollar Brows. 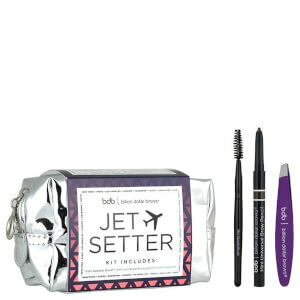 Housed in a handy zipped cosmetic bag, the travel-sized tools allow you to create perfectly manicured brows on-the-move. Crafted from durable stainless steel with a unique coating, the tweezers have been specially aligned for superior pulling power, whilst the slanted tips allow you to grip even the shortest hairs for preened and perfected eyebrows. Adapts to skin tone and delivers natural-looking colour for all skin tones and hair colours. Mechanical and self-sharpening, the retractable pencil glides on effortlessly to shape and style eyebrows to perfection. A must-have tool for shaping and defining eyebrows. Expertly blends colour, whilst taming unruly hairs for a natural, professional-looking finish.